Hi there Galaxy S Blaze Q press shot and thanks for bringing us an image with a date of August 15th, which just so happens to be the date we’ve called for the release of said device. It tends to become a pattern with both HTC and Samsung hinting at release or announcement dates with their press images, and this case appears no different. We’re still looking at this device with the hopes that it will have rumored specs of a 1.5GHz dual-core Snapdragon S4 processor, 1GB RAM, 16GB internal memory, 720p HD display, 1080p rear video capture, Android 4.0 Ice Cream Sandwich, HSPA+ 42Mbps, and of course the five-row QWERTY keyboard. For now, all of those specs should be taken with a grain of salt as rumored, but with the phone expected to launch next week it shouldn’t be long until we find out everything. I would love to get that for my wife. How big is the screen? I hope this phone is basically a SGSIII in a QWERTY body (or close to it). That keyboard looks really nice. Damn why is T-Mobile getting all the good phones now? I just bought my S III a while ago. I’m quite surprised that a phone with the Blaze name is getting put with the high end phones. And it has the Touchwiz Nature UX, too! Though I have to say, the screen is probably still 4.0 inches, or possibly 4.3. Unless you are a big fan of the physical keyboard, S3 is way better than this phone. Yes! This is what I’ve been waiting for! Thanks David! Fingers crossed that those specs are correct! I think that’s the phone my wife wants when we get to upgrade next month. I’m leaning toward the GS3, especially if the One X+ is unibody like the One S.
If those specs turn out to be true, then this will be THE phone for my sis! She has a Sidekick 4G and she drools over my GS3. I was going to get her an S3, but she’s not quite ready to give up a hardware keyboard yet. This would be a very happy medium for her. definitely doesn’t look like a 720p screen. looks like WVGA, same as Blaze 4G (probably will have S3 processor, too). 1. How do you get that from a picture with a lower resolution than either screen would have. 2. The adds are never pictures of the actual screen, they are always Photoshopped so you can’t trust it. The ratio of the screen doesn’t look 16×9 (too much bezel lengthwise). And that’s a lot of bezel…if the screen is larger than 4 inches, then it’d be a a huge phone, and there wouldn’t be a 720p screen on a 4″ device… not yet and not for a mid-range device. Nature UX? Smart Stay? S-Voice and all that GS3 stuff? If this phone does have GS3 features then that’s good news for the GS2’s future. I m waiting to offically by T mobile.. if this specs are real.. S4 Snapdragon, 1.5 Ghz, 42HSPA+, and over 4 inches with Android 4.0 or higher, I WILL BUY IT!!! wheres the galaxy s 3 Q? i love to see men saying things about their imaginary wife. Hmmm. Some of these specs DO NOT align right with that screen size. 720p being the most obvious one. I’ll eat my shoe if this thing is 4 inches with a 720p screen. That would make it something like 380ppi, making retina display on the iPhone look silly in comparison. I’ll be cautiously optimistic about this one. I’m hoping for the 720p screen with a 4.3 “or 4.5” size. That would make the keyboard a good size and give enough room for that 5th row of keys. I can’t wait. I just hope the invoice price is tempered by the lower ram, cpu, and screen size compared to the SGSIII. It’d be nice if this rang in closer to $500. Any hints on NFC, battery capacity, and RF band support? I want to believe in these specs so bad. But I just feel like I’m going to have my heart broken. Can you provide a link to where these specs are confirmed in a FCC document? Pretty sure they only test things having to do with the radio, not the processor and screen. That link is to an engadget article that is speculating about the actual stats. If you read the source, there’s NOTHING in the FCC documents that say what the specs are, other than dimensions, radio frequency, and interference tests. Why wouldn’t it have a S4 processor and 720p screen? First of all, the SOC: it’s been reported that Qualcomm is having trouble keeping up with OEM demand for S4 processors(http://www.theverge.com/2012/6/13/3082481/qualcomm-snapdragon-s4-28nm-shortage-tsmc). I imagine Samsung will use any chips they can get their hands on for their biggest-selling handset, the Galaxy S III(all US versions use the S4). As for the 720p screen, assuming the part about the screen being 4 inches is correct, this would be the first phone to have such a screen, and have the best pixel density we’ve ever seen in a smartphone. You really think that some qwerty phone on the nation’s 4th-largest carrier, a handset that Samsung has created ZERO buzz about, will be the first to bear that honor? I suppose it’s possible that it could be a 4.3 inch screen, but I think it more likely that it will have the same screen as its namesake, the Galaxy S Blaze. 4-inch, 800 x 480. Again, I’d love to be wrong, but the only evidence we’ve seen that these rumors are correct is speculation by tech blogs and a user agent screenshot. You KNOW how rumors have a habit of running wild on these tech blogs, only to be incorrect. Remember when the Galaxy S III was going to have a 1080p display? Yeah. This is looking like a good choice for my wife too. She insists on a physical KB and broke the screen on her MyTouch 4G Slide a few weeks ago. Are keyboard phones a female thing because there is an inordinate percentage of posts here indicating “wife” (or “sis”, in one case). i was wondering the same thing. my girlfriend loves qwerty keyboards too but so do i. it’s practically the whole reason i didn’t just go iPhone in the first place when the G1 came out. Nope. I’m planning on going back to the G2 because I can’t type on this Sensation. 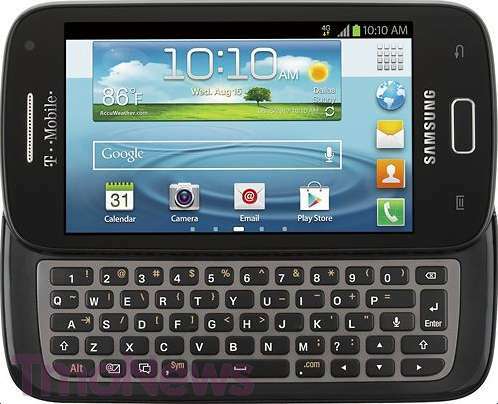 basically a Galaxy Blaze with a slide out QWERTY keyboard. So the Galaxy Blaze has a 720p display, s4 processer, 1080p video recording as well. Hmm never knew. I have a Blaze, Like it very much, except for the camera, I hope that the one spec that is wrong is the 5 megapixel camera.. I will probably get this anyway but an eight would be great. 5MP is fine if it has a great sensor w/ BSI. Are your trying to print out a poster or something? lol. Anything about the wireless industry. Right. Because your post makes a great point. This isn’t what one calls a “low-end” phone buddy. These specs are right up there with the average “high-end” smartphones. Phones such as the GSIII and HTX OneX are just superphones. This phone (if the specs are correct) will be quite the phone. The only thing I wouldn’t like about this phone if the spects are true is the fact that it doesn’t have Jelly Bean. I am still not completely sure that I would want a phone without Jelly Bean on it though, the idea of a Qwerty is intriguing. any idea what neighborhood price this phone will land in? I like the device but man….What an awful name!!! I’m sure they could have come up with a better name than that!?!?!? This looks like an exciting phone for those of us that still want a physical keyboard. I am still using my G2 with a GLite ROM on it and it is great. I am suprised the full specs are still not known/released if this thing is supposed to launch in a few days. If the camera is nice I am jumping on it immediately. Is this phone really coming out tomorrow? Besides the spy shots, there are no screen caps of sales sheets or spy shots of stacks of boxes, or in store dummy phones, or phone in hand working model spy shots. Pretty suspicious sounding to me. I’m happy to buy this phone if the rumored specs are real and it isn’t that thick. But one day away and no info about specs, phone in the wild shots or store related info, makes me very skeptical. How can there be so little info about a phone supposedly out tomorrow? That’s a great question, with no leaked info right now, it’s certainly it’s not coming out tomorrow,. another failed news report. good job tmonews ! Disappointing…..I would have liked to have had an update even if it was just to say they are looking in to the story. There isn’t any update, we had a rumored date for release, it didn’t come to pass. It happens in the tech world, it’s unfortunate but there really isn’t anything to update. As soon as we can get a new release date, we’ll post it. Sounds good. I just got my hopes up a bit too high for a nice keyboard-ed device to replace my G2. Not your fault. I was just hoping to see a quick update much like the one you posted in the comment above. Keep up the good work as this is a site I keep an eye on often. You can’t possibly be mad at me for bringing you leaked intel on a device and then beyond any control of mine, it doesn’t come true? If that’s the case, you should really stop reading tech blogs. Or try and understand how they work.